New York Fashion Week may be over, but the iconic Burberry plaid never goes out of style. Keep your manicure fresh and fashion-forward with this NYFW-inspired design from Neroli Nail Designer, Lisa. Step 1: Prep nails for polish with nail polish remover. This step is really important! Any oil or lotion that is on your nail won’t allow the polish to adhere and dry properly. Next, apply a thin base coat. Step 2: Apply 2 color coats to nails and let nails dry for 30 seconds to a minute in between each coat. Applying thin coats is important so it can drop properly and evenly. Let nails dry for 5-10 minutes before starting art. 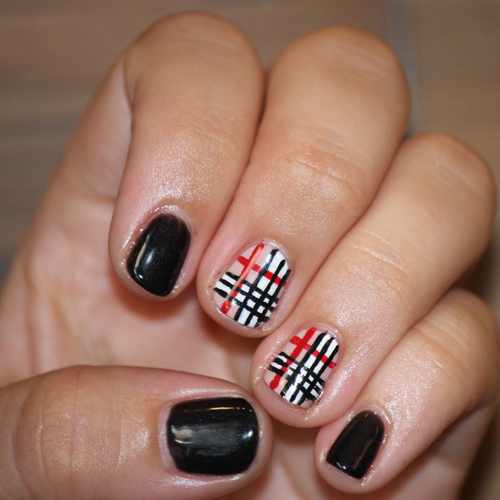 Step 3: Start your Burberry nail design by painting a vertical line with white paint (or polish) slightly off center down your nail. Paint another line going down closer to the right side of nail bed, leaving a thicker space in middle. Fill in with white. Step 4: Paint a horizontal line slightly below the middle of your nail bed. Paint another line going across, just a little above the tip of your nail. Then fill in with white paint. Step 5: Once the white area of your Burberry design are complete, paint with a vertical line down on the opposite side of your furthest white line using your red paint. Connect it with a red line going across the top area of your nail. Step 6: Lastly, outline your thick white lines with thin black lines. Finish the look by painting black lines in the middle. Step 7: Once your art has set for about 5 minutes, apply a thin top coat. Make sure to cap the edges of your nails to seal everything in, too! This step helps your polish application to last a lot longer.